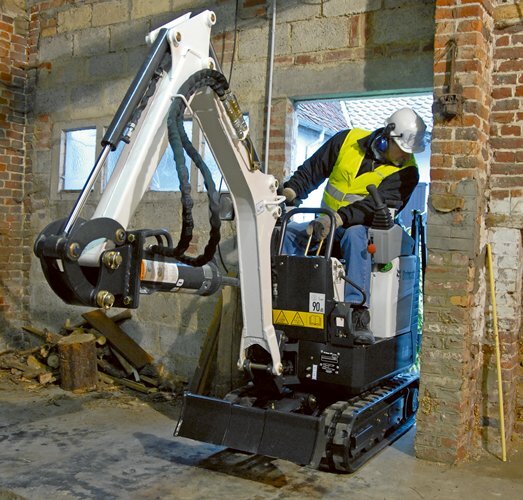 The E10 is an easy to transport micro-excavator ideal to go through most standard door sizes. Thanks to their compact design, both the E08 and E10 can pass through most European size doors. Without any tools, the TOPS can be folded down quickly and is integrated into the frame to minimize the overall width of the machine. 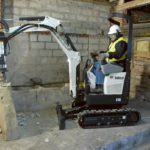 The front blade and the undercarriage are retractable to achieve this reduced width, and in normal operation will provide top class stability. 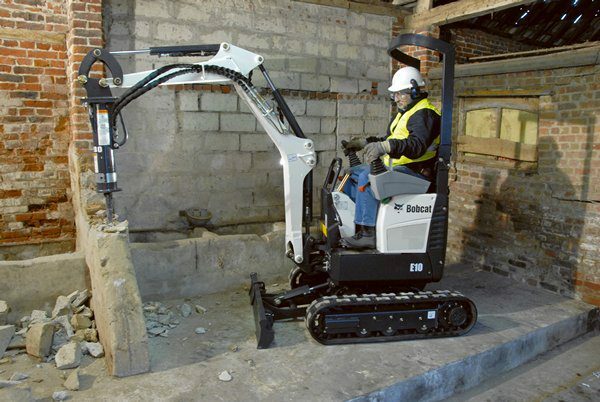 The expandable undercarriage provides the Bobcat E08 and E10 with one of the widest stances in the micro excavator segment (1000 mm and 1100 mm respectively). The resulting “square” footprint provides unsurpassed stability. Added to this is a workgroup featuring a box structure design, providing strength while minimizing overall weight of the workgroup. The sliding blade extensions eliminate loose parts that require storage space and are easily lost. Simply slide them to the inner position to reduce the overall width. The unique design allows the operator to fold down the TOPS in just a few seconds. Two pins lock the TOPS in place while operating the machine but allow for quick, efficient removal and installation when passing through narrow spaces. The unique feature is the integration of the TOPS into the upper structure which reduces the overall width of the machine and eliminates any bulges on the sides. 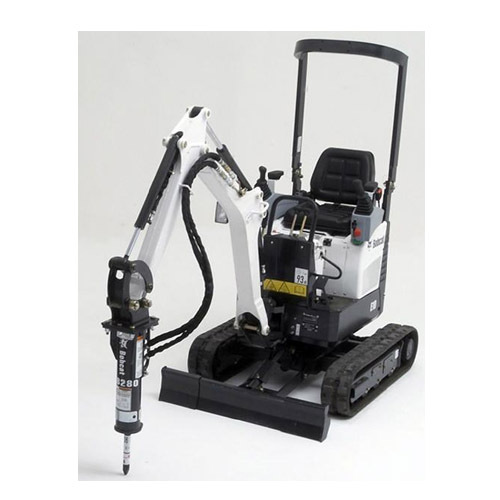 Keeping in mind the request from the customers, the E10 offers zero tail swing capabilities–. 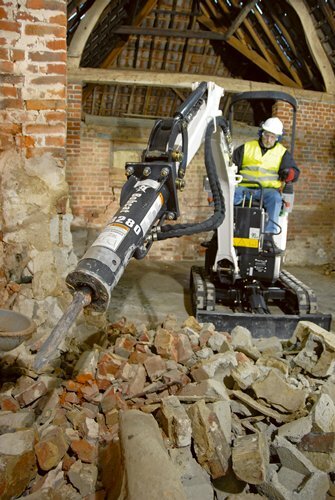 The E10 is a true ZTS, which means the operator can fully concentrate on the job on hand. The use of metal covers and a large cast counterweight provides excellent corner protection and extra durability. Durability is important for machines of this class, as they usually work in confined spaces and are frequently used by inexperienced operators. 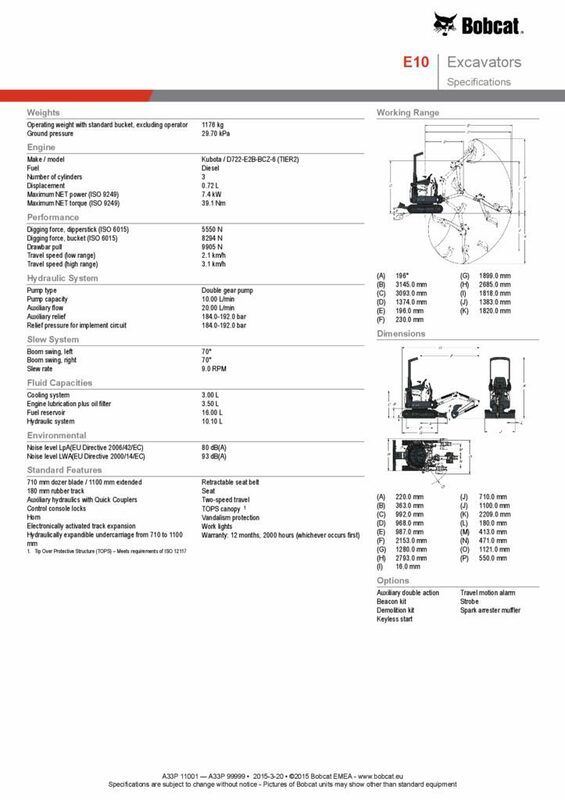 The workgroup of these excavators features a cylinder over boom design eliminating the possibility to damage the cylinder. The hoses for the auxiliary hydraulics are routed inside the boom to prevent any damage when working. These two features help to increase the durability. Right from the start, we paid particular attention to easy service access: these units have a single access point for the daily maintenance of all the main components, for checking the fuel gauge and refuelling through the lockable cap. These new excavators use the same engine as the 319, 321 and 323 excavators. This provides proven reliability as well as low vibration and noise levels which are a must when working in confined areas. The cooling system delivers best in class performance. This is critical when working in confined areas where air flow may be minimal. 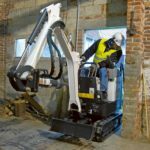 When the machine is frequently used with a hydraulic breaker, the “demolition kit” will provide extra cooling so the breaker can be used 100% of the time even in warm environments. 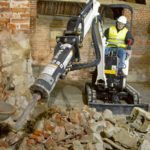 This is unique in the market and makes these two models ideal for in-door demolition applications.